POLICY: We convert ideas into policy proposals to take to government stakeholders. 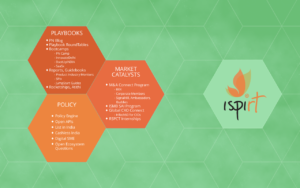 As part of the advocacy efforts we explain, educate and inform government policymakers and other policy bodies that a vibrant software product industry is vital to India’s future. To aid policymaking we also provide unbiased data about the product industry through our Product Industry Monitor reports. We strive to have a symbiotic relationship with trade organizations, including NASSCOM, and see them leading the charge of converting our policy prescriptions into reality. MARKET CATALYSTS: We convert actions of self-help communities into market catalysts for the Software Product Industry. Many intractable ecosystem problems can’t be solved at the firm level. However, they can be solved by a self-help community of individuals or companies. We are creating open-access market catalysts to improve access to Corporate Development (to increase M&A), Indian SMBs buyers and Global CIOs.